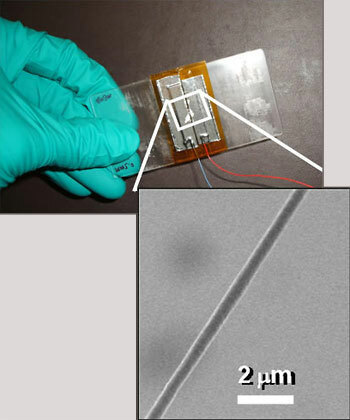 (Nanowerk News) In research that gives literal meaning to the term "power suit," University of California, Berkeley, engineers have created energy-scavenging nanofibers that could one day be woven into clothing and textiles. The goal of harvesting energy from mechanical movements through wearable nanogenerators is not new. Other research teams have previously made nanogenerators out of inorganic semiconducting materials, such as zinc oxide or barium titanate. "Inorganic nanogenerators — in contrast to the organic nanogenerators we created — are more brittle and harder to grow in significant quantities," Lin said. “Surprisingly, the energy efficiency ratings of the nanofibers are much greater than the 0.5 to 4 percent achieved in typical power generators made from experimental piezoelectric PVDF thin films, and the 6.8 percent in nanogenerators made from zinc oxide fine wires,” said the study's lead author, Chieh Chang, who conducted the experiments while he was a graduate student in mechanical engineering at UC Berkeley.